Pork Belly’s Sandwich Shop is a new place that’s opened up on Venice’s Abbot Kinney boulevard, a stretch of Venice with more than its fair share of restaurants. Pork Belly’s isn’t likely to get lost in the shuffle, however, as there are few serious barbecue places in Venice or anywhere else on Los Angeles’ west side. They had a soft open recently, and they were kind enough to have your humble enthusiast by and offer a couple of sandwiches, gratis. 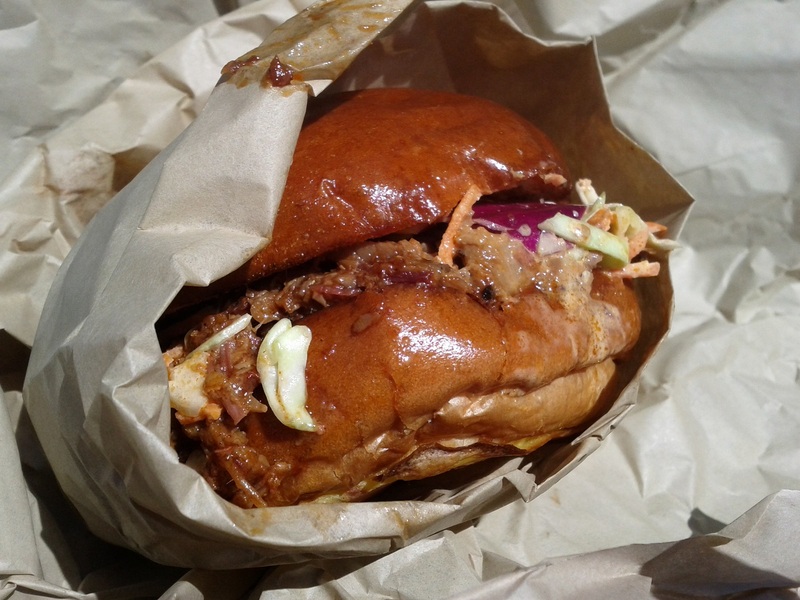 What you see above is The Chop, a brioche roll hosting a pile of chopped smoked brisket and a fair bit of coleslaw. It’s quite good, though I prefer brisket in falling-apart slices than minced, but that can be forgiven. Before it opened, I feared this was going to be another barbecue place that’s all tomatoes and sugar, with little regard for the more subtle aspects of barbecue. That turned out to be unfounded; while the brisket is sweet it is not overwhelmingly so, and there are a host of peppery, spicy notes. The coleslaw is a nice textural contrast and is lightly dressed, an important quality all too neglected in most coleslaws. Ultimately, Pork Belly’s offerings are quite good, with a caveat. The quality of the sandwiches was helped considerably by the dearth of options in Los Angeles, and West LA in particular. In a vacuum one could rate sandwiches with total objectivity, but it’s terribly difficult to eat sandwiches in a vacuum. In the context of its location, this is a fine sandwich shop. I heard one employee remark that there were no good barbecue places in Los Angeles. This is inaccurate, especially if you include South and East LA and the cities just beyond. 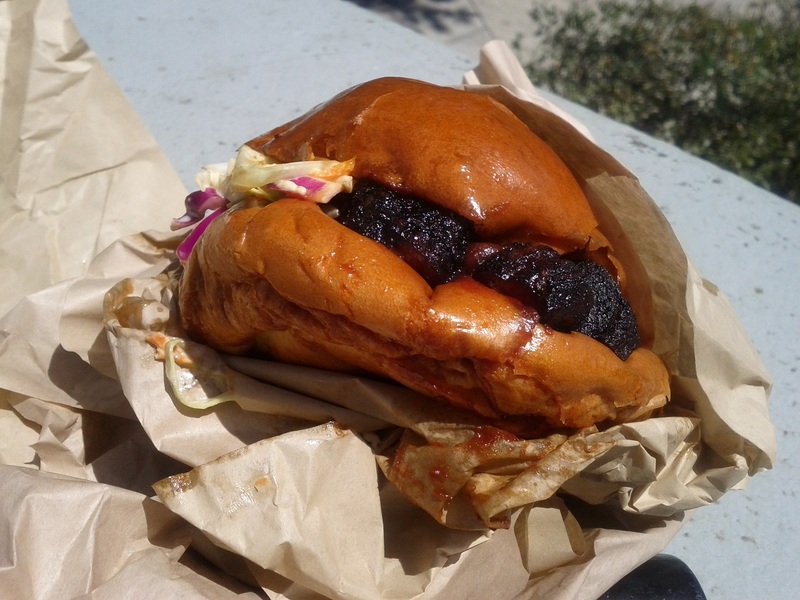 But it’s a long trek from Venice to Bludso’s BBQ, especially when there’s now such capable execution on Abbot Kinney.